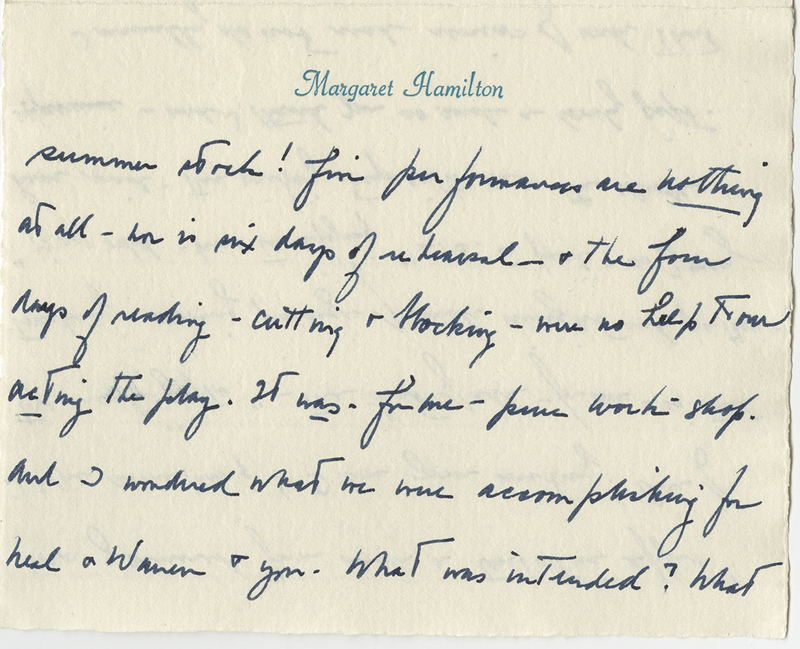 The papers of American author James Purdy (1914–2009) at the Ransom Center include a missive written to Purdy in the spring of 1971 by the actress Margaret Hamilton (1902–1985). 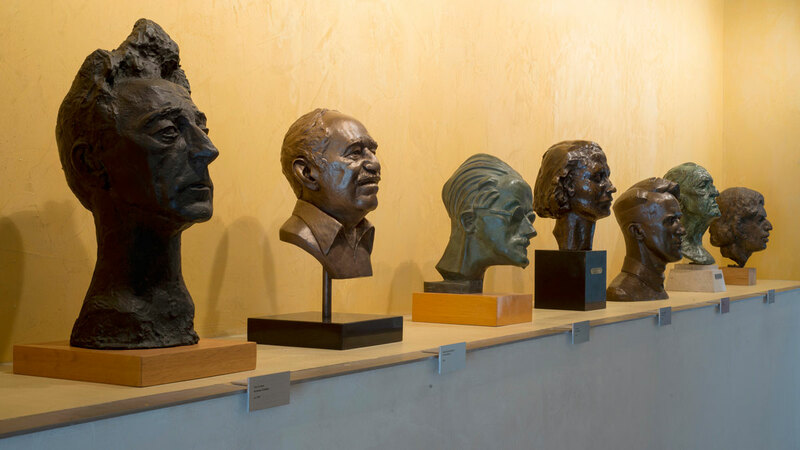 Hamilton is, of course, best known for her role as the Wicked Witch of the West in the 1939 film version of L. Frank Baum’s The Wizard of Oz. 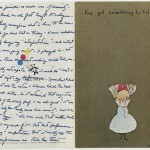 The communication fills three pages of a whimsical Rosalind Welcher greeting card and continues onto both sides of a sheet of the actress’s personalized note stationery. 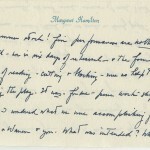 From internal evidence in Hamilton’s letter, as well as from an earlier one in the collection from playwright Neal Du Brock to Purdy, it’s evident she had starred in Du Brock’s dramatization of Purdy’s novel The Nephew. 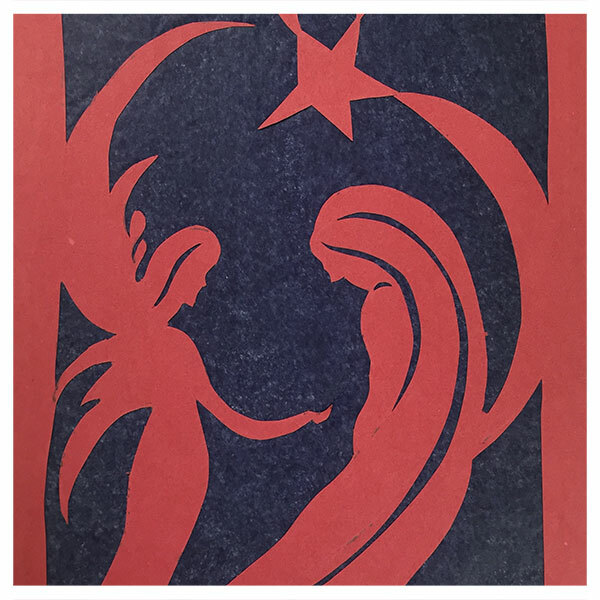 The production was presented by the Studio Arena Theatre in Buffalo, New York in early 1971. Du Brock’s adaptation wasn’t particularly well received and closed with considerable gloom among the play’s company. 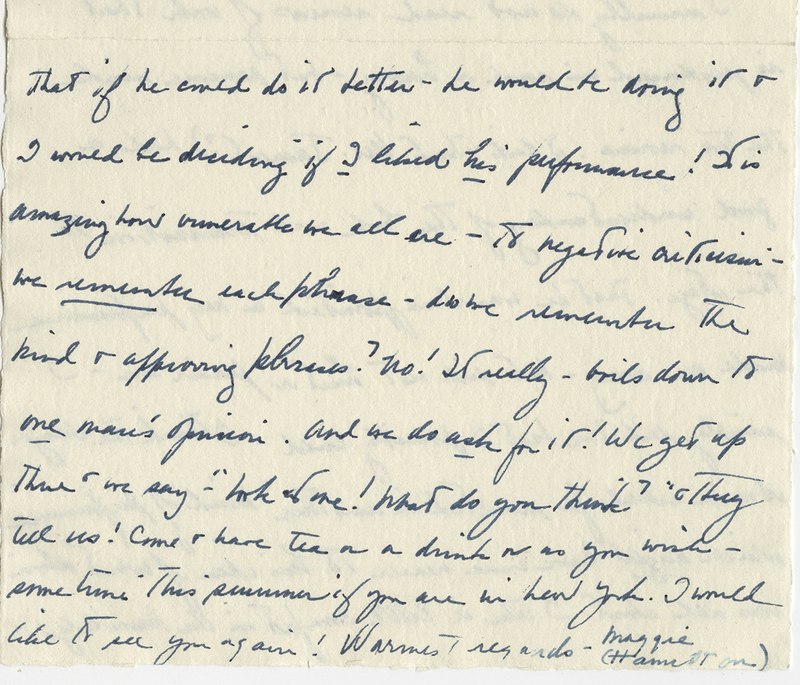 Purdy evidently wrote a consoling note to Du Brock, which led Du Brock to suggest that Miss Hamilton, who had clearly felt stung by the reviews, might be cheered by a positive word from the original author. 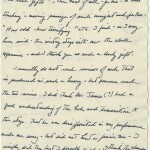 Purdy’s ensuing note to Hamilton seemingly helped lift the actress’s spirits, and she responded in her letter of April 23, 1971, “how very dear of you to write me…and perk up such a dismal Easter.” She went on to say she was then in Boston at her alma mater, Wheelock College, recovering from the flu and looking forward, upon her recovery, to appearing in a play with the school’s drama department. 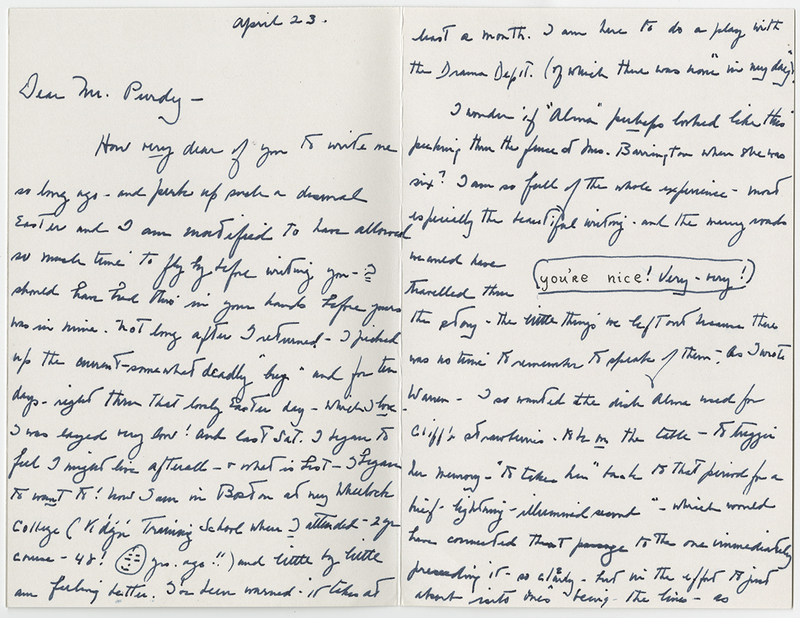 The James Purdy papers are currently being processed and will be available to scholars once cataloging is complete. 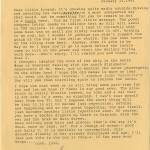 Letter from Margaret Hamilton to James Purdy, dated April 23, 1971. 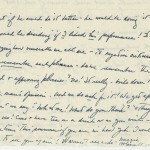 The Ransom Center recently acquired a collection of letters and photographs relating to novelist and essayist Elizabeth Hardwick (1916–2007), co-founder of The New York Review of Books and one of the most brilliant literary critics of the late-twentieth century. 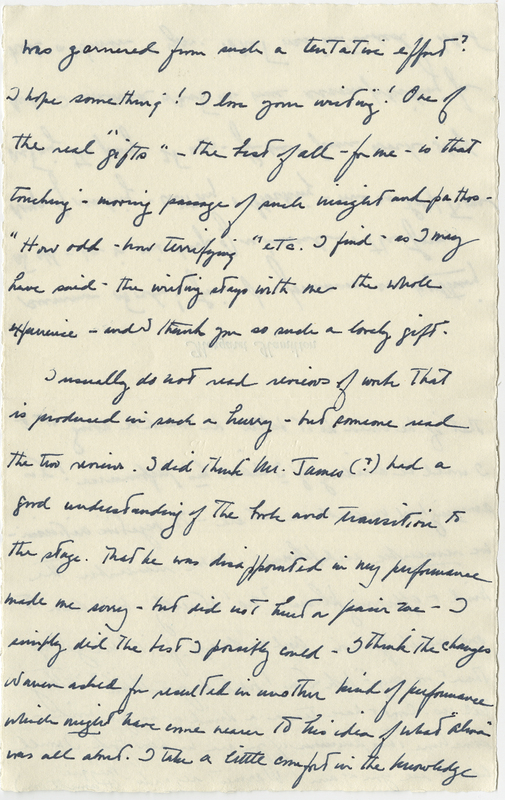 The newly acquired material complements Elizabeth Hardwick’s archive, which she donated to the Ransom Center in 1991. This new material was acquired from Jon R. Jewett, a personal friend of Hardwick—or “Lizzie,” as her closest friends called her. 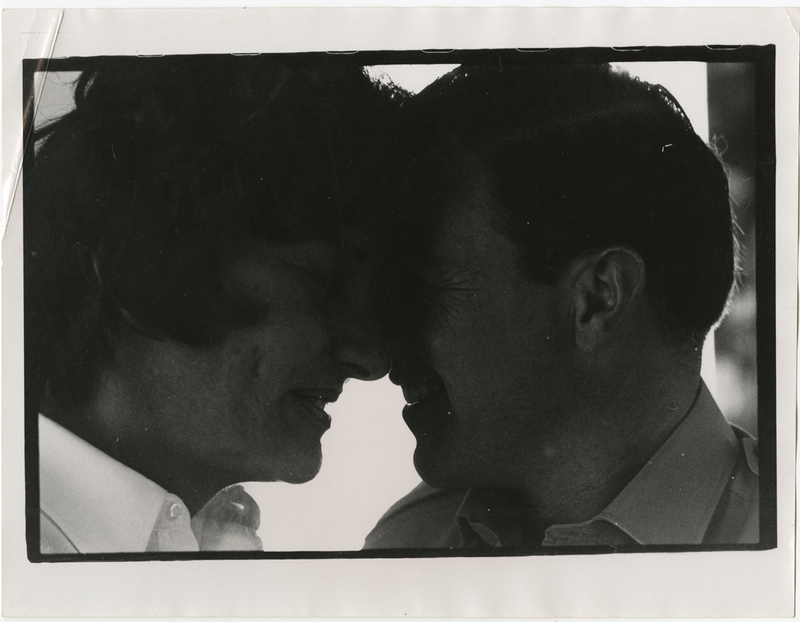 They met in Castine, Maine, in the early 1980s, where Hardwick had a summer residence that she once shared with her former husband, the poet Robert Lowell. 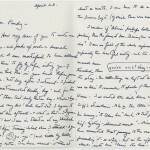 The correspondence in the collection is supplemented with a number of photographs and candid snapshots—including one of a frail but smiling Lizzie taken just days before her death in 2007. 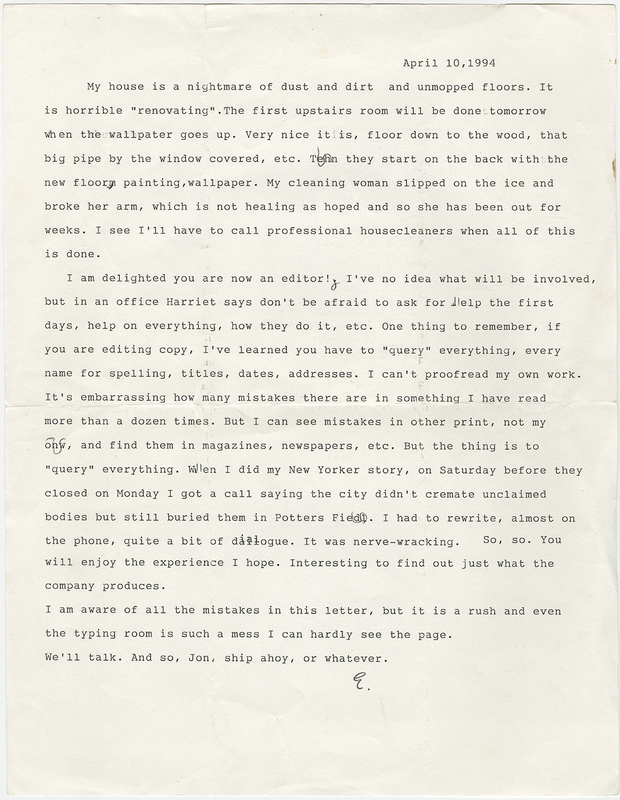 Letter from Elizabeth Hardwick to Jon R. Jewett, dated April 10, 1994. 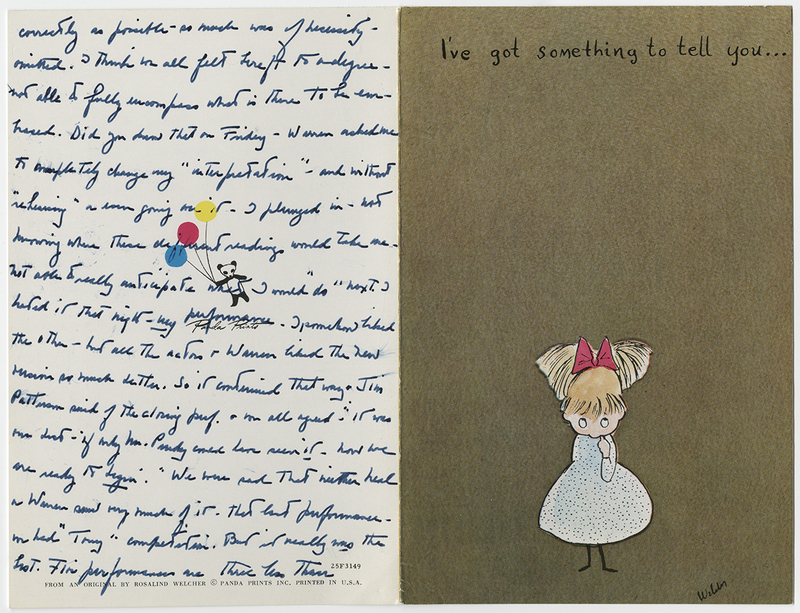 Copyright © 1994 The Elizabeth Hardwick Estate, used by permission of The Wylie Agency LLC. 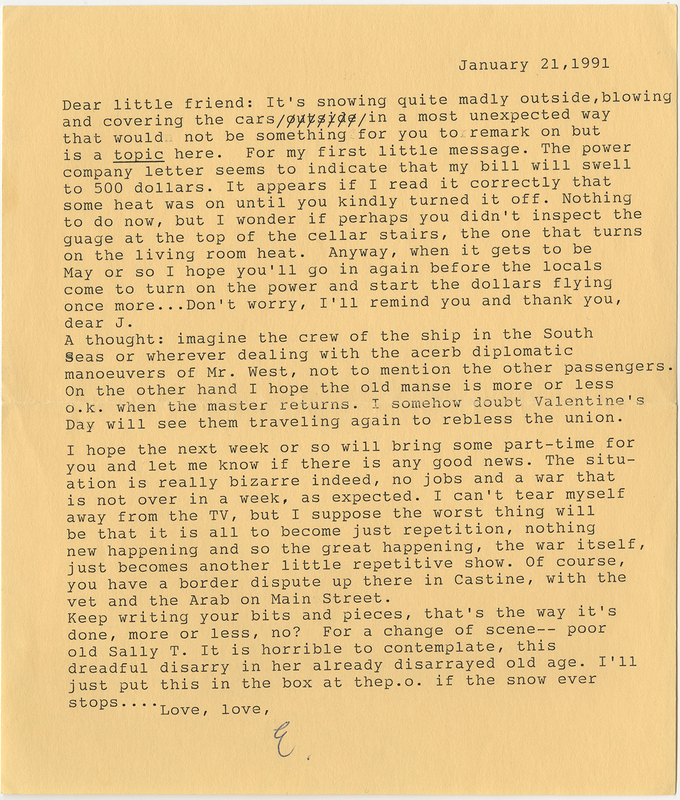 Letter from Elizabeth Hardwick to Jon R. Jewett, dated January 21, 1991. 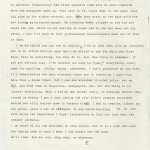 Copyright © 1991 The Elizabeth Hardwick Estate, used by permission of The Wylie Agency LLC.